Combining its Craft Beer Trail with its Craft Coffee Trail is one reason why they call it the Rocket City. Last month Downtown Huntsville launched a new promotion for its growing cluster of gourmet retailers. 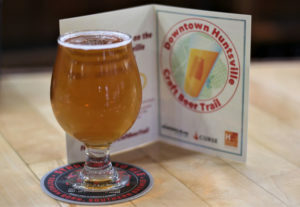 The Downtown Huntsville Craft Beer Trail, in its third year now, is still growing in brewery members and participants. And March this year it is joined by the Downtown Huntsville Craft Coffee Trail, a string of seven java shops in the city center. Like the Beer Trail, the Coffee Trail features a Passport/Card you pick up on one of the stops featured on the trail. At each stop, order any drink you wish and get your card stamped. Collect all seven stamps and you’re rewarded with a free Downtown Craft Coffee Trail Mug. Top prize on the Beer Trail is a Trail Boss collectible bottle opener. “Of the 11 craft breweries in Madison County, seven are in downtown Huntsville,” says Chad Emerson. “It ranges from nanobreweries to the second largest in the state, Straight to Ale. “The budget for the Beer Trail is less than $1,000 a year. Any city could afford this. We get groups from Nashville and Chattanooga just to do the trail. We do it through our social media outreach, and we’ve had features in magazines, such as the Tennessee Craft Beer Magazine. Common to the craft beer and coffee trails is synergy around a lively downtown and younger crowd. “We are starting to see a lot of startup tech companies relocate and open downtown, because they know that will help attract the employees they want,” says Emerson. “The fastest growing tech growth, as well as the fastest in retail shopping growth, is in downtown. The shopping is distinctive on Clinton Avenue. “We’ve had a huge growth in retail and restaurants and drinking establishments — food, beverage and boutiques. What happened in downtown Huntsville is what you would have if you can imagine Mountain Brook or Fairhope or Spring Hill (Mobile neighborhood) in downtown Huntsville. For more information on Huntsville downtown trails visit downtownhuntsville.org.